Known as the “Pirate of the Pacific,” she is the centerpiece of a memorial which serves to honor men and women of our American armed forces. Just a short walk from the American Queen’s dock, guests can explore a Fletcher-Class Destroyer that fought in many battles in U.S. history. Named after Admiral Isaac C. Kidd, who died on the bridge of his flagship during Pearl Harbor, the USS Kidd has received 8 battle stars for WWII service and 4 battle stars for Korean War service. This 2,050 ton, 376 foot-long vessel has since been converted into a museum, with exhibits of extensive collections of war artifacts, ship models, memorial hall, real fighter planes and bombers, and memorials. Here you can step onto a simulated Mardi Gras float, discover the difference between Cajun and Creole, and experience multimedia presentations of Louisiana history, industry, and culture. This impressive museum showcases collections of visual arts, jazz, costumes, textiles, and artifacts from Louisiana history. It was founded in 1906 and holds over 450,000 artifacts and works of arts. Permanent exhibits include: “Living with Hurricanes: Katrina and Beyond,” “Experiencing Louisiana: Discovering the Soul of America,” and “Grounds for Greatness: Louisiana”. The tallest capitol building in the nation was constructed during the Depression. Get a birds-eye view of the city and mighty Mississippi River from the 27th floor observation deck. This prime example of Art Deco Architecture was extremely popular in the 1930’s and stands 450 feet tall. The building holds 34 floors making it the tallest state capital in the United States. Guests can admire the uniquely constructed rooms throughout the building or take a ride up to the 34th floor to the observation deck where an impressive panoramic view of the city can be found. Located inside the Shaw Center for the Arts, the LSU Museum of Art seeks to enrich and inspire through collections, exhibitions, conservation, and education. Founded in 1959, the Louisiana State University Museum of Art has been fully accredited by the AAM and offers over 14 impressive galleries. Admire showcases from American, European, British, Chinese, and African influences and over 5,000 art pieces. Learn about the history of art and the influences it has on modern art styles and explore the extensive collection of original paintings, sculptures, photography, and more! A Gothic architectural monument located on the bluffs overlooking the Mighty Mississippi. This incredible building has withstood war, fire, scandal, and abandonment. It is now referred to as the Museum of Political History and has received awards for the architecture, exhibits, and preservation. Learn the history of Louisiana’s capital city, art, culture, and politics while you explore the original artifacts and interactive exhibits! Enjoy an included tour of Nottoway Plantation, the South’s largest remaining antebellum mansion. This stunning historical plantation lies between Baton Rouge and New Orleans. The mansion flaunts three-floors, 64-bedrooms, and displays an incredible 22 white square columns which contribute to its’ nickname—“The White Castle of Louisiana.” The most popular room among guests is the White Ballroom, which is painted entirely in white and displays elaborate gold décor throughout. Rooms are trimmed in custom plaster frieze made from Spanish moss, clay, plaster, and mud and are all original to the house. And as if that weren’t enough, this immaculate mansion was constructed with 365 openings—one for each day of the year. Enjoy a guided walking tour of an American Castle as we explore within the pristine walls of Nottoway followed by a stroll through the lush grounds and gardens. JEWELS OF THE LOWER MISSISSIPPI - Explore the land of bawdy blues and Southern belles. 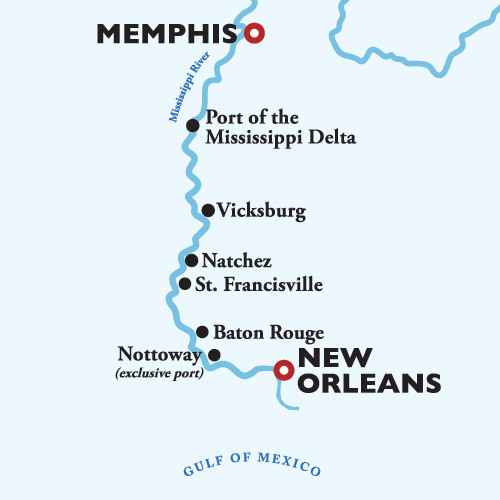 This journey showcases the diversity and drama of the Lower Mississippi River. From Memphis to New Orleans, the river rolls slowly and expansively, smooth as a southern drawl. The bayous and woodlands along the shore create dramatic landscapes that are virtually unchanged since the days of the French fur traders. Gracious towns with palatial mansions and tree-lined streets abound. History is everywhere - in silent Civil War cemeteries and virtually everywhere you turn in Memphis, best known for jazz, barbecue, and of course The King of Rock and Roll and his home at Graceland. Port Charges are additional and not included in the fare.